CAMBRIDGE — Carpool lanes are proposed down the middle of Highway 401 as part of a suggested 10-lane widening of the freeway eastward from Hespeler Road to Halton Region. The idea was an option at a 2009 public information session that was part of an ongoing Ontario Ministry of Transportation planning process to upgrade the six-lane highway from Cambridge eastward. Now, the “preferred option” to upgrade the 401 includes “provisions for high occupancy vehicle — HOV — lanes, to address long-term needs,” ministry spokesperson Bob Nichols said. The highway within a highway proposal goes out for public comment this week at meetings in Cambridge and Puslinch Township. One inner lane in each direction would be marked with diamonds on the asphalt and overhead signs saying only vehicles carrying two or more people are permitted. Police would enforce the rule. The other four lanes of traffic in each direction would be used by trucks and other as it is now. The Hespeler-Halton project is one of several planning studies complete or underway to upgrade Highways 8 and 401 from south Kitchener, through Cambridge and Puslinch Township to Mississauga. There’s no firm timeline to start any of the work. Plans have been approved — but not funded — to upgrade the interchange at Highways 8 and 401 by adding a westbound ramp. Currently, southbound traffic on Highway 8 must exit at King Street to enter Highway 401 westbound toward Woodstock. Detailed design work is underway for widening Highway 401 between Highway 8 and Hespeler Road, said Nichols, of the Transport Ministry. The work is proposed in two phases, possibly starting by 2015. No cost estimates are available. The first phase includes the rehabilitation of the Highway 8 to Highway 401 “flyover” ramp, and replacement of the Fountain Street and Speedsville Road bridges over the 401. The second phase includes widening Highway 401. That’s similar to what’s needed for the next block of the 401 heading eastward from Hespeler Road to Halton Region. • Expansion of two carpool lots. 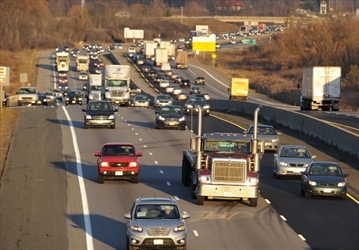 The Transport Ministry is talking to Waterloo Region officials about adding express-bus bypass lanes on the 401 between Kitchener and Cambridge. Provincial officials are also talking with the City of Cambridge about a pedestrian bridge spanning the 401 near Franklin Boulevard. Ministry traffic projections say Highway 401 between Hespeler Road and Highway 6 needs eight lanes by 2016 and 10 by 2031. WATERLOO REGION — Six lanes will become 10. Two overpass bridges will be replaced. Tall high-mast lighting, bus bypass shoulders and noise barriers will be added. This will be the new look of the widened Highway 401 between Hespeler Road and Highway 8 in about two years. The Ministry of Transportation's target completion date for all that work, which is still in the bidding process, is 2016. All the construction makes its first big impact this summer with the closure of the Speedsville Road bridge over the highway, according to Waterloo Region strategic transportation planning manger Paula Sawicki. The drivers who use that 4.6-kilometre stretch of highway every day — we're talking 125,600 vehicles daily as of 2010, up from 79,000, 20 years ago — are already on notice. Your bumper-to-bumper patience will be tested over the next two years. "Delays should be expected," said ministry spokesperson Liane Fisher in an email to the Record on Friday. Short-term lane restrictions and closures will be required during some phases of the widening, she said. But six lanes will be maintained during peak periods. The design and staging details are not yet available. Neither is the total price tag, which the ministry won't make public until after bidding is complete. But whatever headaches construction brings, a more free-flowing highway is welcomed by the City of Cambridge, which sees itself as a cost-competitive option to locating in Toronto for both business and people. "We welcome these improvements to transportation infrastructure which will accommodate greater capacity," Mayor Doug Craig said in an email statement. "This will also have benefit to tenants in the new Boxwood Business Campus, along with our citizens and broader business community." Boxwood includes 100 shovel-ready acres of "prestige" industrial land east of the Cambridge Toyota plant near that stretch of the 401. On Thursday, the countdown to the expropriation of private lands required for the widening began with a public notice of an application from the ministry. Compensation offers to owners of 20 properties will be made. The ministry, Fisher said, expects to have ownership and possession of all the properties required for the 401 widening project by July 2014. This spring, work to rehabilitate the old Speedsville Road and Fountain Street bridges over the 401 begins. As well, the ramp from Highway 8 southbound to the 401 eastbound will be rehabilitated. The two bridges are expected to be completed by fall, 2015. For now, the cost estimates have not been announced. "To ensure a competitive procurement process, we will not be publicizing cost estimates of either project," Fisher said. "However, we will share the project costs public once the contracts have been awarded." The bus bypass lanes are not dedicated bus lanes. Instead, they are wider shoulders which Grand River Transit buses can use during severe 401 congestion. The added cost of the bus bypass shoulders will be on the region's tab, Fisher added. Bus bypass shoulders are expected to open this year on the recently-widened stretch of Highway 8 in Kitchener. Are there any designs of that the proposed new interchange of highway 8/401/king street would look like? Seems like a complex task. I think there was a hypothesized design on WW or SSP. It wouldn't be too complex, but would involve a substantial flyover. Quote: CAMBRIDGE — The City of Cambridge is expecting things to get a little noisy when work to widen and upgrade Highway 401 begins this fall. Without discussion on Tuesday night, a committee of Cambridge council supported granting the Ontario Ministry of Transportation an exemption from the city's noise control bylaw from Sept. 8, 2014, to the end of 2018. The exemption must still pass a vote at a Sept. 8 meeting of council. The city's noise exemption bylaw prohibits "noise arising from the use of material handling equipment" between Saturday and Monday mornings, except in emergency situations. George Elliott, the city's commissioner of transportation and public works, said the exemption will allow at least some parts of the work to take place on weekends and at night. He said the more than four-year exemption is customary for such a large project. "Typically the noise bylaw is meant to take care of undue construction activities or residential activities, but when it comes to a construction project, (noise) is one of those inconveniences we all have to live with." The bylaw exemption granted by the city applies only to a stretch of highway spanning from 500 metres west of the King Street East/Regional Road 8 ramp, to the Hespeler Road exit. The ministry says it needs the exemption because certain construction procedures will need to take place overnight on weekends, when traffic volumes are relatively low. During the next four years, construction crews will widen Highway 401 from six to 10 lanes and rebuild four overpasses that stretch across the highway. The province's plan calls for the residential streets of Kitchener Road and Marmel Court in the Preston Heights neighbourhood to receive sound barriers, as homes on Marmel Court are only 200 metres from Highway 401. But there are no plans to erect sound barriers in the area of Linden Drive or Preston Parkway, despite the fact that apartments there are within about 400 metres of the highway. Elliott said the city still has some influence over what time of day heavy construction work takes place on the 401. Saturday night, for the second time this year, Highway 401 will close down overnight. The highway will be closed in both directions between Highway 8 and Hespeler Road as construction work continues on the Speedsville Road bridge. Specifically, crews will be installing girders on the new Speedsville overpass. With the highway closed, the flyover from Highway 8 to the 401’s eastbound lanes will also be closed. The same stretch of the 401 was closed overnight once in May. When it shuts down at 10 p.m. Saturday – likely reopening around 7 a.m. Sunday – drivers will again be encouraged to detour along Hespeler Road, Maple Grove Road and King Street. Work to rebuild the Speedsville bridge is expected to continue into October, with Speedsville Road and two flyover lanes remaining closed for the duration of the project. Next year, similar work will take place on the Fountain Street bridge. Hwy 8 EB/401 EB Flyover now has both lanes open (both sides of the safety walls are now done being refurbished), and 401 WB/Hwy 8 WB lane restrictions at the top of the hill are done. I can't quite tell but it looks like there's about an extra 100 m of merge lane now. Not enough, in my opinion, but an improvement over what was there before. It'll probably take a few weeks for everyone to "get the feel of it" and see if it helps significantly. Does anyone know what work was done on the WB side? I don't drive this area often enough to have noticed a change. It would seem silly to lengthen the existing merge lane seeing that the 401 is being widened shortly. If I had to guess... did they widen the shoulder to be used as a bus bypass lane for the ION buses as the case with hwy 8 to Fairway? The 401 is not scheduled to be widened "shortly". It is still a few years out. A 100m lengthing of a single lane is several orders of magnitude smaller an expense than the 401 widening, and frankly, will likely be useful for making traffic flow a little better once construction does hit. Bus bypass lanes will only be installed when the 401 is widened. It looks like the EA is about to be completed. I really wish they would make these things more available online. It is insane that in this day and age I have to get in my car and drive 10 or 20 km to an office to read some documents. How hard is it to PDF something and put it on a website? I thought this was a done deal and construction was to start in the spring? Is that not the case? The new Speedsville Road Bridge may be opening soon. They were paving all weekend, lane reductions were in place late last night and I could see them installing guard rails on both sides of the bridge. **just checked the City of Cambridge road closures site and they have scheduled re-opening for December 19th.